I'm posting a bit later than I wanted to today, I managed to fall asleep at 5pm for two hours! I went for a really long walk today to do a nail polish haul so I guess I just got too much fresh air! Anyway, I told you I had a gorgeous flakie to show you didn't I? I bought this from Llarowe in January and I'm so in love with it! It's no secret that I'm gutted I didn't get my hands on Unicorn Puke or Clairvoyant, so I was waiting patiently (okay, maybe not so patiently!) for a multicoloured flakie, and this was worth the wait! Festival has a clear base with multicoloured flakies suspended in it. My favourite flakies are the ones that have a lot of bright blue in them, and this one is a turquoise explosion. It has a lot of bright pink as well. Turquoise and pink together remind me of drawings I used to do of my name on MS Paint when I was younger! The formula of this polish was a little bit thick, and meant that sometimes I had gaps with no flakies near my cuticles, but that was easy to fix. I'm more than willing to put up with a thick formula for this effect! This covered okay with one coat, but two coats was so much better. This is one of those polishes where it goes on thin for the first coat then the second coat seems much thicker and more densely packed with flakies. I've included a one/two coat comparison just to illustrate my point! 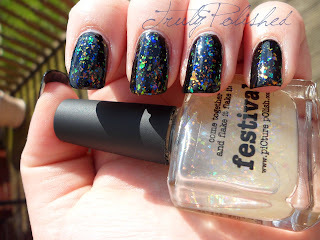 In these photos I'm wearing two coats of Festival over two coats of the black polish I swatched yesterday. This polish is so beautiful! It's available here at Llarowe where it retails for $16.50. Llarowe ships internationally and from personal experience, I've found their customer service to be really good! I'm travelling to the Netherlands tomorrow afternoon to see my Dad for 10 days, but don't worry, I'll be swatching as much as I can with the new polishes I bought today. I'm hoping to find a few continental beauties out there too! I've also got a gorgeous post for tomorrow, it's a good one!